As a photographer, I would like to know what all of you like to view, buy, see on your walls…when it comes to photographs. To encourage you to give feedback, I am creating a weekly random drawing for those who leave a comment. Each week I will feature two of my photos on the website’s home page. Click on the home page tab to see the contest giveaway photos. You can comment on any photo on this site or just comment on photos you like (or hate) in general. Tell me what you enjoy viewing or what is overdone from a photographic perspective. Below are photos from one of my favorite places to visit-Robinson Nature Center- two miles from my home. Next week I will blog more about this wonderful place and its history. This entry was posted in Photography and tagged butterflies, Columbia, contests, flowers, free photos, insects, Kathi Isserman, Maryland, moths, nature, photography, Robinson Nature Center, roses, scenics, Travel and Tourism, United States, US Capitol. Bookmark the permalink. Really like both of the pics. The first is so perfect, it almost looks fake! Would make for a great greeting card, besides looking great on any wall! LOL. Thanks, I think, Irish. It is real! LOL It really was meant as a compliment Kathi…really! Like I mentioned, everything about the pic is just so perfect. The clouds, the sky, the trees. even the little umbrellas on the front deck…totally captivating and awesome! I’m just kidding. You won a photo too with that comment. Go to the home tab and choose A Rose is a Rose or Wings of Fancy! Thanks for viewing. I do appreciate all comments. I particularly like the second one. Was it taken using a macro lens. What sort of camera do you use. I also love the first one, especially the clouds – I like clouds. I use several cameras. A Nikon D7000 for most of my wildlife shots, a Nikon D3200 for most every day work, and now I carry a point and shoot Fuji850x. It shoots great macro and is a good back up. The moth was shot using the D3200. I zoomed in at 300mm(450 mm 35 mm equivalent). I usually do that for several reasons-my mentor once told me that zooming in and close up were interchangeable so I experiment with both, but more importantly when shooting a living creature I try not to disturb its environment. Check out the home page for the featured photos! The first one does almost look like it was Photoshopped, but it is gorgeous. I love love the second. That butterfly moth is lovely. That is my favorite. I don’t know much about photography but you are really great!! The first one is HDR or high dynamic range where you post process a series of 3 images. Sometimes it works and sometimes it doesn’t. Thanks for the kind words and feedback. Kathi, I’ve long admired your photographs. I used to do photograph way back in the 1970s, when it was real film and developing chemicals. LOL. And you had a Rollei? Wow. I never kept it up my photography, though. Your photographs are breathtaking. The composition is artistic and the colors so vibrant that I must ask what could be akin to a sin or worse, but do any manipulation of the images via Photoshop or such after taking the photos? Thanks, Patty. I still use a film camera but not as much. I do post process. I shoot in RAW not jpeg so I can control the depth of highlights, shadows and vibrancy. Most of my photos are adjusted for white balance and the above. The composition is left unaltered unless I crop the photo. A RAW file is 30mb or more so when a photographer prints one, it can be poster size if the photographer has taken a sharp image. No photo program can correct a bad shot, unfocused and blurry. The definition below is what a RAW image is. All pros shoot in RAW, and a lot of amateurs too. “Raw image files are sometimes called digital negatives, as they fulfill the same role as negatives in film photography: that is, the negative is not directly usable as an image, but has all of the information needed to create an image. Likewise, the process of converting a raw image file into a viewable format is sometimes called developing a raw image, by analogy with the film development process used to convert photographic film into viewable prints. The selection of the final choice of image rendering is part of the process of white balancing and color grading. Thanks for the response, Kathi. I’ve got your web bookmarked to check and enjoy new pics. 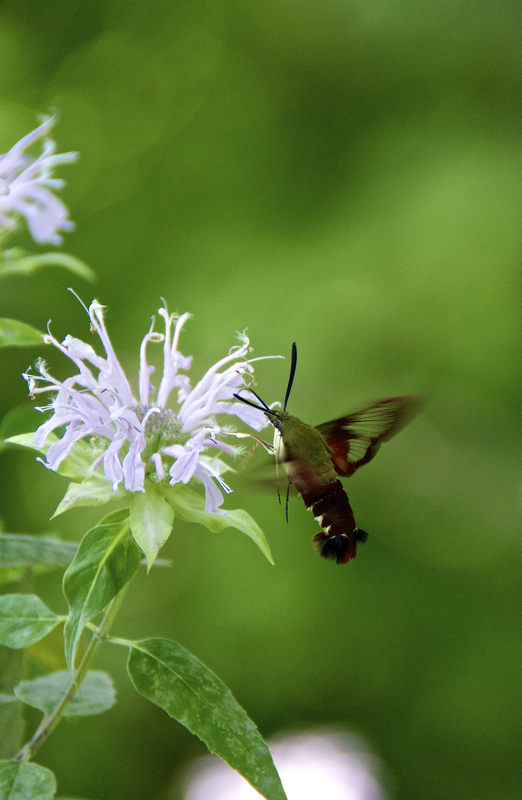 Hi Kathi, I really like the Hummingbird Moth photo best. The focused body and the green bokeh in the background are fantastic. Thanks, Bob. High praise from you. Thanks for checking in.